No information has yet been found about the formation of the Dulwich Branch of the No-Conscription Fellowship, but it counted as members two very early opponents of the war and conscription in South East London, namely Arthur Creech Jones of East Dulwich and Sarah Cahill of Lewisham. Its meetings took place at the Dulwich Independent Labour Party (ILP) headquarters in Hansler Hall, Hansler Street, East Dulwich and its members came from nearby areas in today's boroughs of Lambeth, Lewisham and Southwark. They were predominantly socialists and trade unionists many of whom also held religious convictions. In 1917 the branch produced a pamphlet What Are Conscientious Objectors ? giving information on its membership, which Cyril Pearce describes as "an unequivocal statement by a self-confident, radical and substantially working-class anti-war community". The pamphlet lists its members who were absolutists and those who had been imprisoned and who had accepted the provisons of the Home Office Scheme. The pamphlet gives the names of 16 COs from Lewisham and 7 from Deptford whose biographies can be found in the links in the table below. 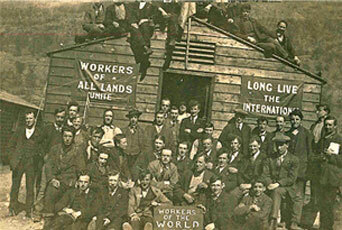 The photograph to the right of a gathering of Internationalists is taken from the Peace Pledge Union (PPU) website http://www.ppu.org.uk/ and reproduced with their permission. Full members of the NCF's branches were men who were eligible for conscription and who would refuse to fight. Older men and women were associate members and were extensively involved in the work of the NCF itself, especially when the younger men were imprisoned. From May 1916, Percy Neaves who had exemption under the Pelham Committee scheme and lived in Lewisham's Blackheath Ward was the Secretary of the Blackheath Branch of the NCF. In Dulwich Sarah Cahill was the branch secretary in August 1917 when she wrote to Catherine Marshall, the Parliamentary Secretary of the NCF. She reported on the condition of four of the Dulwich branch members who were imprisoned as absolutists and whom she had recently visited or was in correspondence with. Clara Gilbert Cole, another associate member from Camberwell who had joined the NCF when it was 200 members strong "  also wrote and visited Lewisham COs in prison and published her experiences in 1936. Cotterill, Henry Frank Frayling, Walter Russell Fuller, Horace Valentine Grimmer, William H.